On Monday, ECHO staff and interns were joined by a few more brave volunteers who are helping to make the walkways passable again as we begin the major job of cleanup. 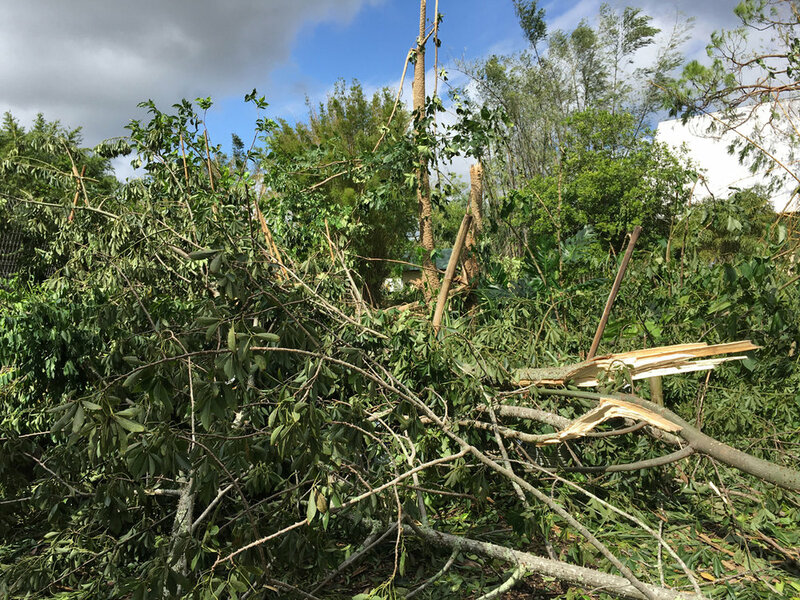 We are clearing debris, staking and righting trees, cutting down trees that can’t be saved, and many other jobs in between, all without a reprieve from the Florida summer sun. Meals for 30 were prepared on a gas stove, with food from fridges running on generators. Our Seed Bank is protecting hundreds of rare seed varieties on a propane generator that was installed just one year ago. While the days are hard and tiring, we are mindful that we are not the only ones affected. Thank you for your prayers and support! We could not do this without you! 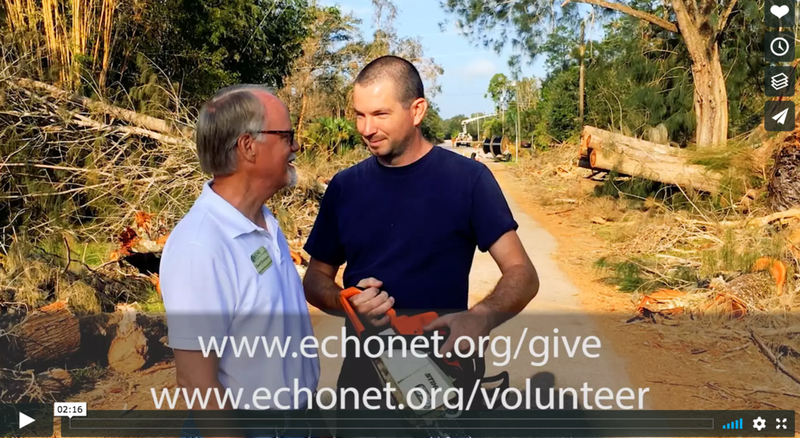 In this update, David Erickson talks with Jake, a volunteer who drove 26 hours to help ECHO clear debris and get back to our mission of reducing hunger and improving lives around the world. Let’s start with the good news – there’s a lot of it. Most importantly, everyone on staff with ECHO-Florida is safe! ECHO buildings were spared any serious damage – over and over, huge trees fell right next to buildings without damaging them! In addition, all of the animals on ECHO’s Global Farm made it through alive and, with the complete loss of electricity, ECHO’s investment in a propane-fueled backup generator for the Seed Bank is paying off. We are SO grateful to God! Given the intensity of the storm, this is amazing. The bad news is real, but pales in comparison. 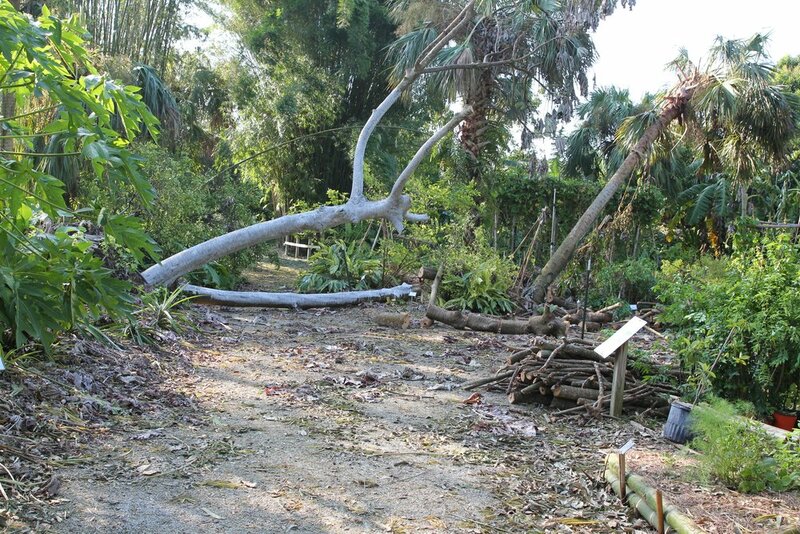 At least 32 major trees and bamboo clumps were snapped-off or uprooted by Irma’s winds. Plantings in the research plots and sections of the Global Farm were shredded. Sections of fencing were destroyed. Power will remain out for days to come. The costs to ECHO will likely reach $100,000. This is a lot, but much less than we had feared! 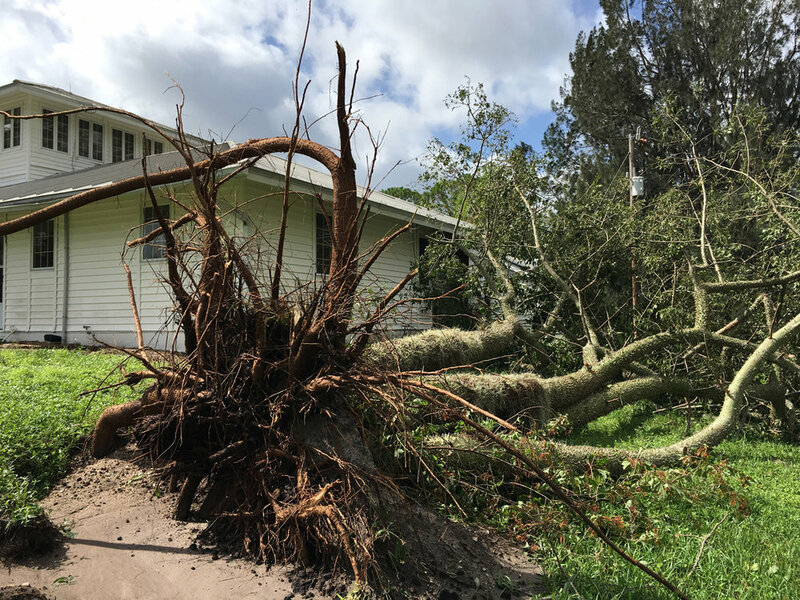 3.Special gifts totaling $100,000 to cover the costs of responding to Hurricane Irma and enabling ECHO-Florida to quickly get re-focused on our global mission. 4.Collective expressions of thanksgiving for the “relatively” modest destruction from Hurricane Irma. It could easily have been so much worse! IF you want to volunteer and can get here within the next few days please e-mail Heidi at HVeres@echonet.org or go to www.echonet.org and click on “Get Involved” where you can sign-up to volunteer. We’ll be back in touch right away. 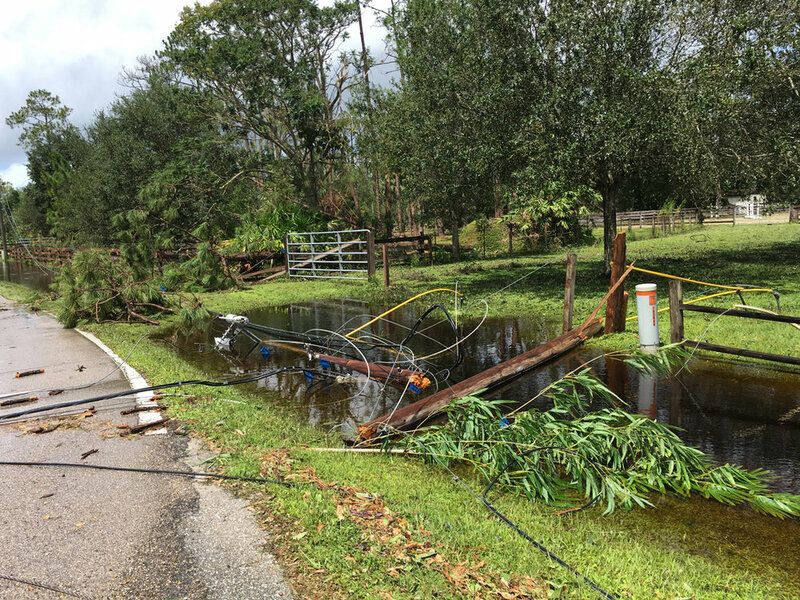 IF you can help with our recovery from Hurricane Irma, please go to www.echonet.org, click on the “Donate” tab, “Give Now” and indicate that your gift is toward “Hurricane Irma Recovery”. Trees on perimeter of ECHO's Global Farm had to be cut for emergency response vehicles to pass. In just a few hours, Hurricane Irma is expected to be upon us. Over the last 24 hours the projected storm track has shifted our way and now the forecasters are projecting that we will experience a direct hit. Wind gusts over 150 mph and extensive flooding are anticipated. Yesterday we stripped everything off our greenhouse to reduce wind resistance and, hopefully, preserve the structure. Some particularly dense” trees were also thinned to improve their chances of survival. The winds at the front end of the storm are now arriving and many of us that hadn’t evacuated are now facing mandatory evacuations. We are likely to lose power in the next few hours and be cut-off from communications. Meanwhile, please know that your expressions of support and prayer have meant SO MUCH to us! You have encouraged us and many of you have reminded US of why ECHO’s work is vital. 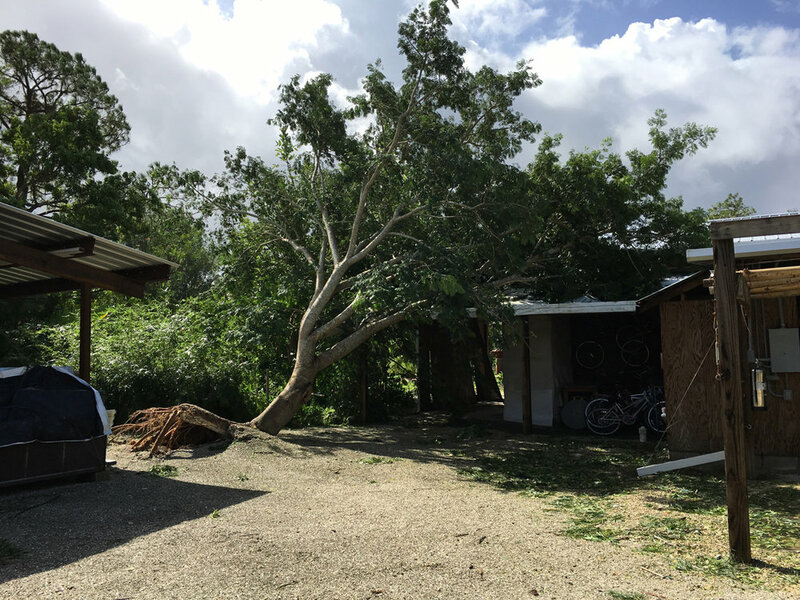 We’re trusting the Lord in all of this and will send an update as soon as possible after Irma has passed.